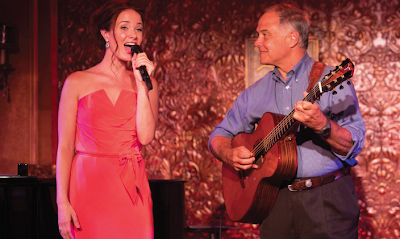 Here is another live recording of an intimate concert that took place at 54 Below, this time with the young soprano Sierra Boggess, who had her Broadway debut as Ariel in Disney’s THE LITTLE MERMAID. Here she begins with a good rendition of “I Have Confidence” from THE SOUND OF MUSIC that rivals with Julie Andrews, followed by an enjoyable “Lovely” from A FUNNY THING HAPPENED ON MY WAY TO THE FORUM proving that there’s more to her than being lovely. Between songs and conversation, Boggess tell us about the people who inspired her, from her family to people like Andrew Lloyd Webber and Harold Prince. She sounds like she’s at home and her enjoyment sounds genuine. I saw her in A LITTLE MERMAID and in the DVD concert of THE PHANTOM OF THE OPERA and in both performances she was serious, so I never knew she possessed the comic side that she reveals here. With an interesting choice of songs, including a few from Disney movies, Boggess reveals a versatile style and voice that sounds as good in the operatic “Quando M’en Vo” as in Dolly Parton’s country “Wildflowers”. I also like the fact that she chose songs like “How Come” and “Can You Imagine”, which are rarely sung. One of the highlights is the hilarious “The Ultimate Medley with apologis to ALW” and I also love the Barbra Streisand segment that ends with a beautiful rendition of Kander & Ebb’s “A Quiet Thing”. There’s also a very touching rendition of “Smoke Get in Your Eyes” and “You’ll Never Know”. During the concert she recalls reading a review of A LITTLE MERMAID where someone referred to her as a “nobody”; I’m sure that person have already swallowed those bitter words. Boggess is a very talented actress/singer and I’m sure that we’ll hear and see plenty of her in the near future.